The Posh by Courtney Team will secure a beach location for your elopement ceremony of up to 24 guests. Simple and Easy! YOU WILL NOT NEED A PERMIT if your event meets certain requirements. This package includes your Wedding Officiant and filing of the marriage license (you are welcome to supply your own Officiant). It also includes a Bouquet/Bout for the Bride and Groom (red or white roses). Reception not included. Local Vendor List Provided For: Reception Venues, Hair/Makeup, Transportation, Wedding Cake, DJ/Entertainment. *This package is for 24 guests or less including Bride, Groom, Officiant, Planner, etc. No chairs/tables/décor permitted. Each Elopement Location has it's own set of rules, regulations and permit requirements. Permit requirements vary based on the number of guests in attendance. Please call Posh by Courtney for more information. 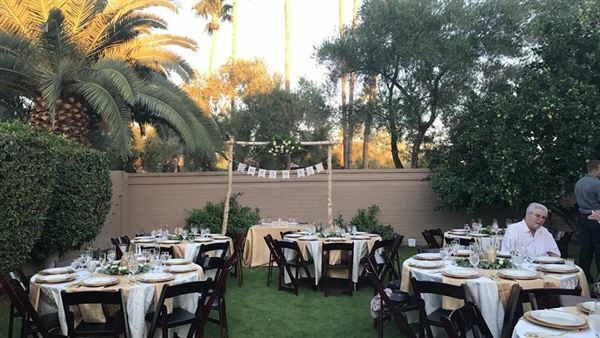 *Additional fees, including the purchase of a permit, will be incurred if you wish to book any of the above locations and would like event rental equipment setup, wedding decorations and 25 guests or more. If You have the venue, We make the Wedding! The Posh by Courtney Team will provide a choice of a chuppah/arch/tent/gazebo, your floral table arrangements, Bride and Groom bouquet/bout (red or white roses), dinnerware, tables, chairs, floor-length tablecloths, overlays/runners, aisle decor, lighting, backdrop, draping and more for your wedding! Includes Day of Coordination: Ceremony, Cocktail Hour and Reception Management of your event at 1 (one) venue location. Up to 150 Guests. Included in this package we are able to provide a wedding photographer for 1 (one) hour (.jpg images, DropBox link, copyright release will be provided to you). For an additional $500 the Posh by Courtney Team will secure a beach, Cliffside or shore-lined park for your ceremony/reception. *There are restrictions on the number of guests allowed at certain beaches. Please call for more information. Package Rate Subject To Change.